At a recent literary event here in Chicago, I got my hands on a surprising book, Love Songs of the Revolution by Bronwyn Mauldin. It’s a thriller (spy novel and murder mystery) set in Vilnius in 1989, and the primary action takes place before and during the Baltic Chain demonstration that occurred in the late summer of that year. While Mauldin’s book offers quite a bit of interest to the general reader, I want to say some things Lithuanians will find intriguing, and I hope this post encourages members of the Lithuanian media to investigate Mauldin’s work. 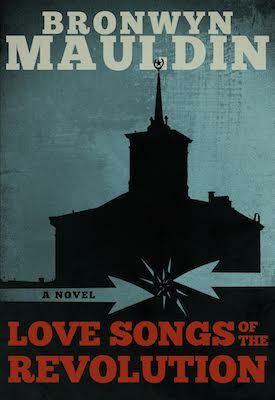 Love Songs of the Revolution is, as mentioned, a thriller. As a first-person account, it’s a faux-memoir penned by a former member of the Lithuanian revolutionary underground. A work of meta-fiction, the book employs a variety of epistolary techniques, including faux-research, blogs composed by readers of the memoir, and tweets of a researcher interested in the identity of the memoir’s author. While slim, only 184 pages, Love Songs packs layered commentary on the nature of letters, the process of historiography, the validity of memory, our preoccupation with memoirists’ “accuracy” and other meta-textual concerns common to contemporary studies of narrative. With nearly a third of the book—indeed, the final third, including the book’s climax—dedicated to this self-reflective shuffle, I found Love Songs as worried about itself as about the socio-politics of the Lithuanian SSR or the identity and psychology of a revolutionary. I don’t mean anything negative by this observation. Indeed, what can be said about a revolution or a revolutionary? Quite a bit but nothing absolute. Love Songs critiques the unenlightened assumption that “truth” lies in data and precise documentation, not in the immeasurable fear and confusion (lust, pleasure, boredom) felt by people in conflict. No doubt, some Lithuanian readers will pick bones with Maudlin for setting her novel in a city she has not visited and staging conversations in a language she does not speak. I can hear the camp that’ll point out, “Inaccuracies!” (and there are some, including a map that mixes up Kaunas with Švenčionėliai) as I can hear someone saying, “This book is about imprecision because the author is self-conscious about her lack of knowledge.” I think any critique like that fails to take the book on its own terms. It might be ironic to fake a memoir when the author is depending on the memories of others and must imagine how the gaps glue themselves to bannisters. That is, however, the nature of historiography. Perhaps the differences seem smaller for those of us who have lived under both systems. In the Soviet era, it was the state who told us how we could and could not live. Here in America, it is the corporations that control our lives, and we are willing participants. Corporations decide what we will see on television and in the movies, what will appear in newspapers, what chemicals and inedible ingredients will be put into our food. If a government did those things to them, Americans would protest, but because something called a corporation does it to them, they pay money for it and beg for more. The story I am going to tell is true; therefore it will not please you. It is direct and straightforward. The dead remain dead, and the guilty go unpunished. The sepia-tinted dream you might wish it to be turns out to be a dull, faded reality. When you close this book, you will frown and use words like “unresolved”. You will come to conclusions, and ask why no one took the actions that are plainly obvious to you. That is because you are Americans, and you believe there is a solution to every problem. That every grief concludes in closure, or that it should. That hard work pays off, and cream always rises to the top. That every crime can be solved in an hour, minutes eighteen minutes for commercial breaks. That satisfaction is guaranteed. You are fools to expect anything but heartache and disappointment. It is your expectations that make you weak. Someone might read that and say, “Maudlin really nailed Americans here.” I hope those same people will realize she nailed, in the same three paragraphs, the post-Soviet mentality as well. And that’s the real triumph of this little book. Every gesture connects the sides it critiques. Photo courtesy of the Chicago Center for Literature and Photography. Categories: Literature, Writing | Tags: Baltijos Takas, Brownwyn Mauldin, CCLaP, Chicago Center for Literature and Photography, faux memoir, happy ending, KGB, Lithuania, Lithuanian SSR, Love Songs of the Revolution, memoir, meta-fiction, NKVD, revolution, The Baltic Chain, The Baltic Way, USSR | Permalink.